Now that we are three weeks into the school year, I can see that the amount of time we read for pleasure has definitely decreased. Between homework and other after school activities, we don't have as much free time to read. I am going to make every attempt to set aside some time each week for us to read just for fun. Whether it's a book, a newspaper, or a magazine, it's important to be reading something. Anything. So, from here on out, you may not always see books posted in our What We're Reading feature, but you'll definitely see some sort of reading material. This one, my friends, is a page turner. From the moment I started reading it, I could not put it down. It's a captivating story of two estranged sisters, family secrets, lost loves, and broken families. The story is told in the alternating voices of the sisters, and that takes a bit of getting used to. It makes for choppy reading, but the prose is excellent and the plot line is riveting. 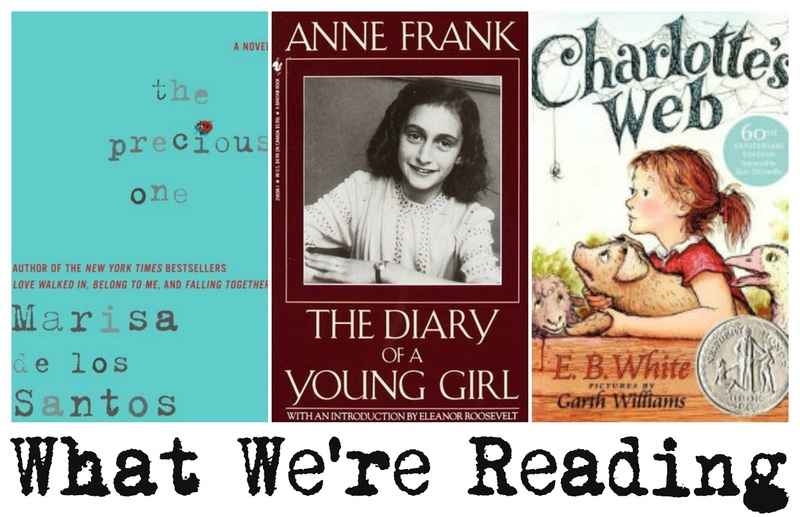 A literary classic and one of my all-time favorite books, Anne Frank's diary gives us a first hand account into the Nazi occupation of Amsterdam. The novel explores the experiences and wishes of a young girl during the time she and her family remained in hiding from the Nazis. It's easy to forget that this book was written by a young teenage girl. Her voice is strong and her writing is eloquent. But at the heart of the book is her powerful message: that despite all the bad, people are basically good. This book needs no explanation. A classic for sure, Charlotte's Web is a heartwarming story of an unlikely friendship between a spider and a pig on a farm. Charlotte, the spider, saves Wilbur, the pig, from slaughter by spinning words of praise for Wilbur into her web. Although this is a children's novel, adults will delight in it as well.